Apparently "Rosa" or some other mentally ill atheist decided to make an impersonation account named @Saucerdotus on Twitter which is a violation of Twitter's rules. Please report this account and any other atheist accounts that mentions "Sacerdotus" to Support. Follow the steps below shown in the pictures below. Have all of your followers do the same and ask them to request the same of their followers and so on. Step 2: Click "more" on the right bottom corner and then select "report tweet." Step 3: A window will pop up. First report as "Spam" and do it again but select "Abusive." 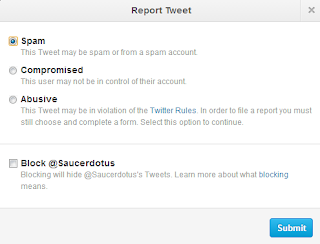 Step 4: First choose "Impersonation" and file a report there and then do the same with "Harassment."